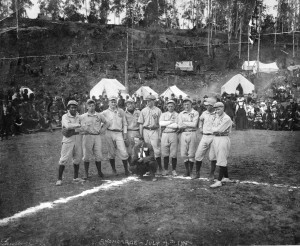 Baseball team, Anchorage, Alaska, July 4th, 1915. FIC Photograph Collection; Anchorage Museum, B1982.046.14. Below are some of the larger on-line collections of archival materials that may be useful for educators in development of curriculum and classroom projects about Alaska history. See For Researchers section for additional institutions and websites with primary source material. Alaska’s Digital Archives presents a wealth of historical photographs, albums, oral histories, moving images, maps, documents, physical objects, and other materials from libraries, museums and archives throughout Alaska. Alaska’s Digital Archives purpose is to provide a single easy to use location for institutions across this state to share their historical resources. The goal is to support the instructional and research needs of Alaskans and others interested in Alaska history and culture. The Oral History Program was established in 1981 to collect, preserve, and provide access to audio and video recordings that provide insight into Alaska’s history and the people who have contributed to its heritage. The UAF Oral History Collection consists of over 11,000 recordings, most of which were donated by organizations and individual interviewers who collected them over the years. Project Jukebox is the digital branch of the Oral History Program and provides synchronized and interactive access to audio and video recordings, transcripts, maps, historic photographs and films from across Alaska. Visitors to the website can listen to hundreds of interviews with those who have lived Alaska’s rich history. Through three decades of collecting, the University of Alaska Fairbanks has built the largest collection of archival films in and about Alaska, with particular strength for the pre-statehood era. The current collection of films and videos combines hundreds of individual donations to UAF with films collected earlier by the Alaska State Library. SLED provides provides easy and equitable access to electronic information resources for, about, and by Alaskans. It was developed by the Alaska State Library and the Elmer E. Rasmuson Library, University of Alaska Fairbanks. An advisory group of citizens and librarians choose sites of interest to Alaskans to include in the project. Funding was provided by the federal government, the Institute of Museums and Library Services, the State of Alaska, and the Rasmuson Foundation. ARLIS provides universal access to natural and cultural resources information about Alaska. Its collections include: books and reports; journals; federal, state, and agency documents; maps; conference proceedings; theses and dissertations; videos; CD’s, photographs, and educational material. ARLIS partners with the following federal and state agencies and libraries to provide access to their materials: National Park Service, U.S. Geological Survey, Fish and Wildlife Service, Bureau of Land Management, University of Alaska Anchorage, Alaska Department of Fish and Game, Exxon Valdez Oil Spill Trustee Council, Bureau of Ocean Energy Management, and Alaska State Library. The Library of Congress has made digitized versions of collection materials available online since 1994, concentrating on its most rare collections and those unavailable anywhere else. The library offers a gateway to a growing treasury of digitized photographs, newspapers, manuscripts, maps, sound recordings, motion pictures, and books, as well as “born digital” materials such as Web sites.